For those of you just joining us on our Canadian Maritime adventure, we are actually back in the USA now – sitting on the coast of Maine at the moment. 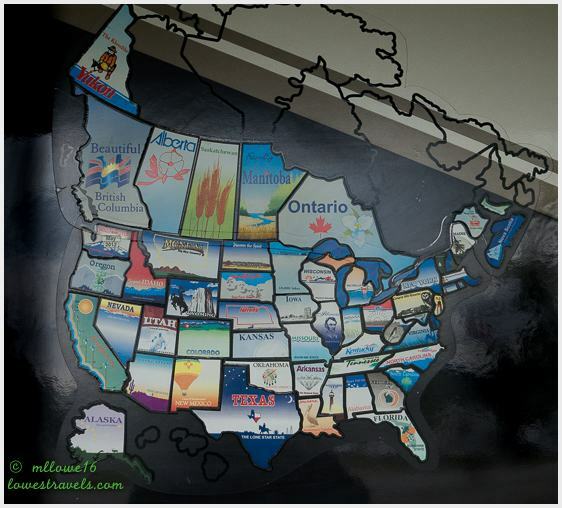 This post is a catch-up to cover our final stop and end of our Canadian travels. We were having such a great time and seeing so many things that sitting in front of a computer had to take a back seat. Besides, not having internet connectivity at times made it impossible to keep up. Anyway, we arrived at St Andrews-by-the-Sea excited, as this was our last stop before crossing the border again. The moment we felt the sea breeze brushing our cheeks as we settled into our campsite, we immediately liked the place. Who wouldn’t? We had another “big screen” view, this time of Passamaquody bay. 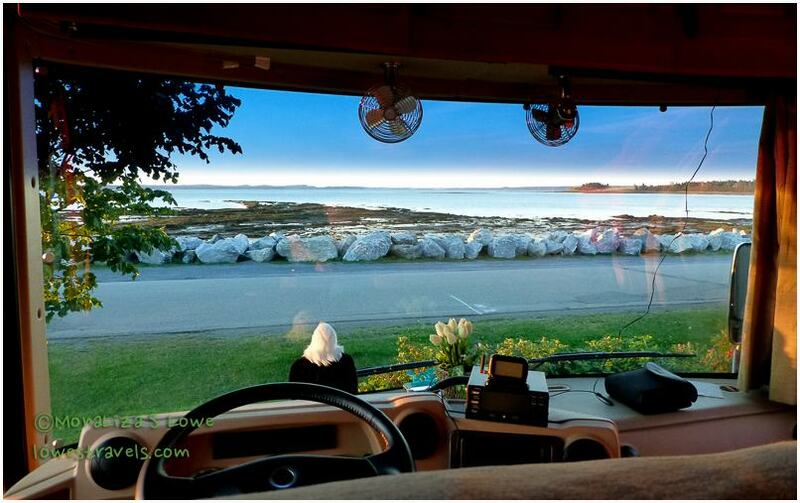 We stayed at Kiwanis Oceanfront Camping – click here if interested in Steve’s review of this great campground. 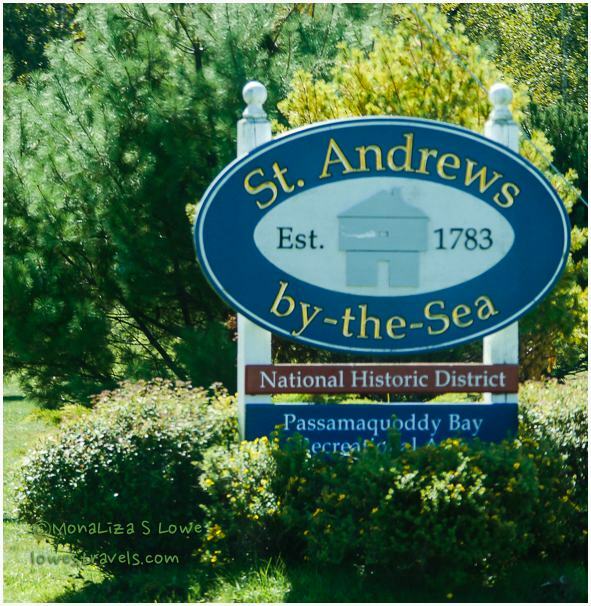 We explored the beautiful little town of St. Andrews-by-the-Sea on foot, as all attractions were walkable from our campground. Having been in the rain for the past few days, we welcomed the sunshine and started early on our sightseeing. 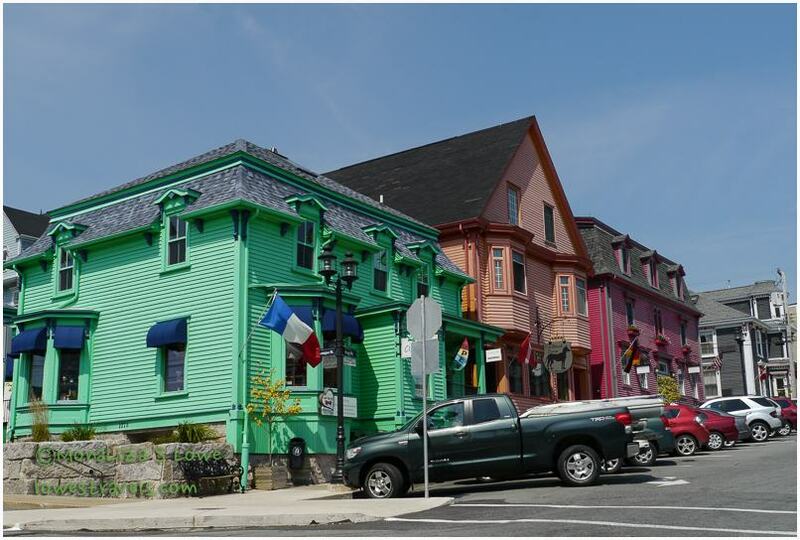 This town was designated as a National Historic District, one of the oldest and loveliest in the Maritimes. We agree. It is loaded with neat shops and excellent restaurants. We could definitely spend more time here! Strolling around this little seaside town, we observed many of the well-preserved original buildings. The local folks we talked to were the friendliest we have met while in Canada. From the lady at the coffee shop to the lady at Olive and Spreads, to the lady at the Irish pub – they were all very helpful! Our wanderings also led us to a blockhouse, which is a building modestly fortified to defend an area. 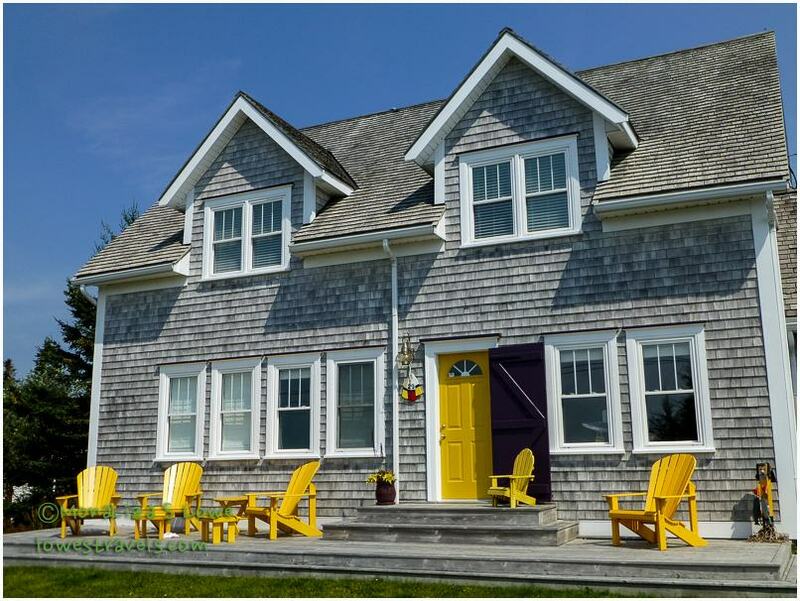 This one was built during the War of 1812 between the U.S. and Great Britain, and it is the last one standing in the Maritimes. 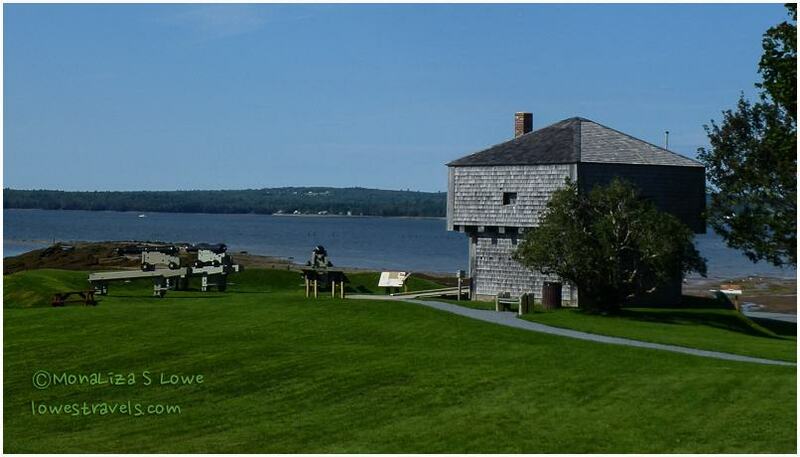 The St. Andrews Blockhouse and Battery has been preserved as a national historic site since 1962. That’s Maine over there across the water where the cannons are pointing! Since Passamaquoddy Bay was only a few steps from Betsy, I went down and explored the tidal floor and checked out the shore birds while the tide was low. 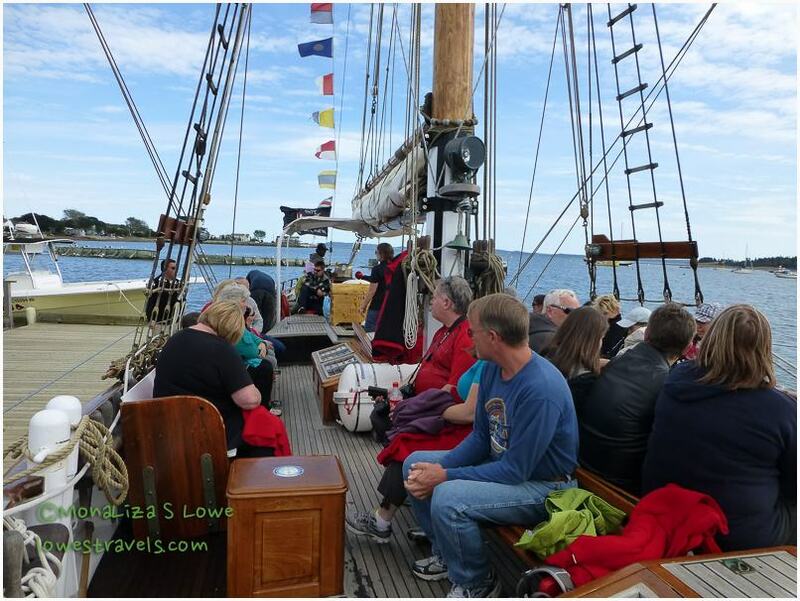 We joined yet another tour, this time aboard the Jolly Breeze. 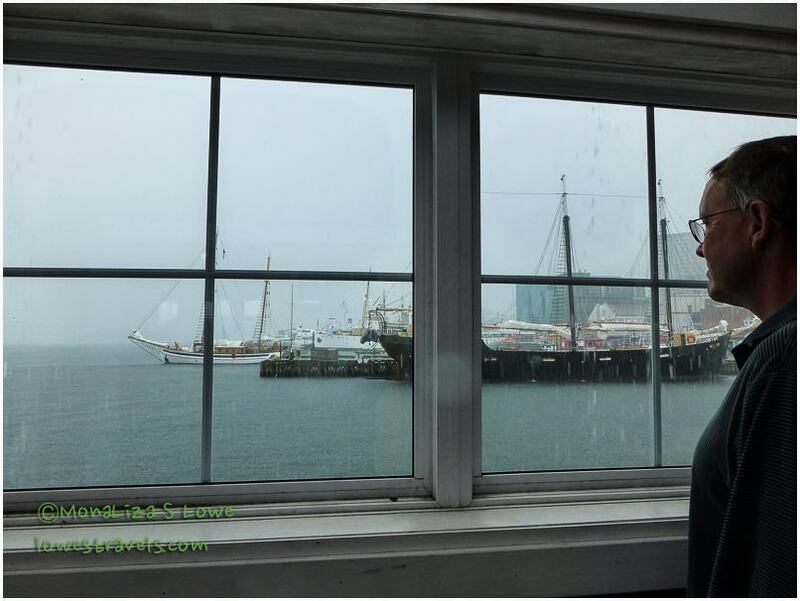 We didn’t go so much to see the whales and other sea creatures (we’ve seen many in Alaska), but more for the experience of cruising aboard a classic tall ship. We saw this ship go by the campground and thought it would be fun to hop aboard. That’s the Jolly Breeze cruising by in our new blog header. A was to be expected, we saw a Minke Whale, Harbor Seals, Grey Seals and a couple of Bald Eagles. Each morning I got up early to catch the sunrise. With the open space and the bay before us, the photo ops were right there for the clicking. I have taken so many pictures that picking one is like picking your favorite sister – too difficult! St. Andrews-by-the-Sea was a great final stop on our Maritime adventure. We liked the look and feel of the town, enjoying every minute of our stay. A rainbow even appeared, as if to confirm Steve’s comment that this was one of his favorite harbor towns of all. 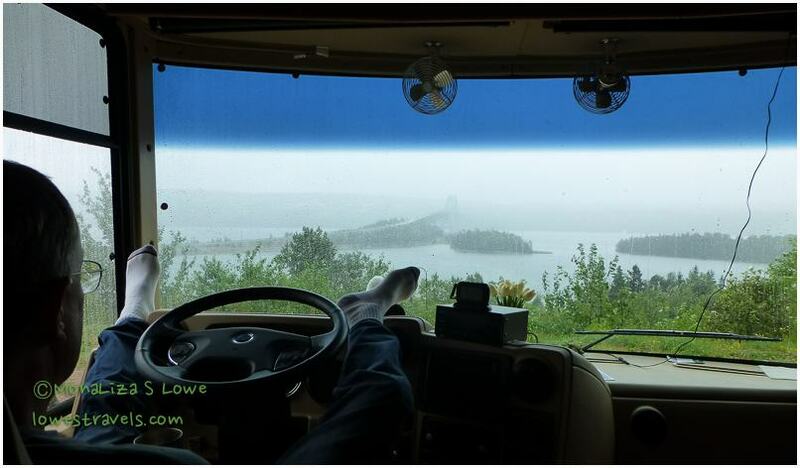 What was originally planned as a two-week trip mushroomed into a whole month of driving around the Maritime provinces, made up of New Brunswick, Prince Edward Island and Nova Scotia. Despite spotty internet in the RV parks, high prices, a lot of rain and some bad roads – the trip was well worth it. The people were friendly and seemed happy to see visitors in their towns. Which province is my favorite? 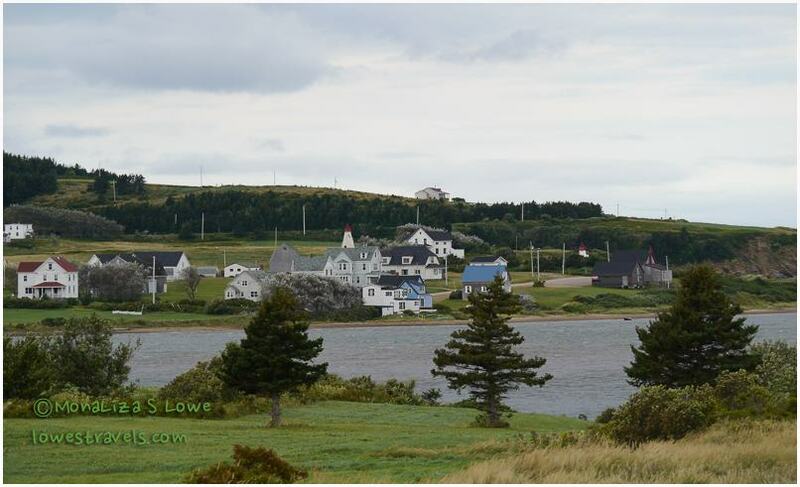 It would have to be Prince Edward Island – the whole island is just too picturesque, pastoral with wide open spaces. Fuel prices – multiply by 3.785 for gallons! 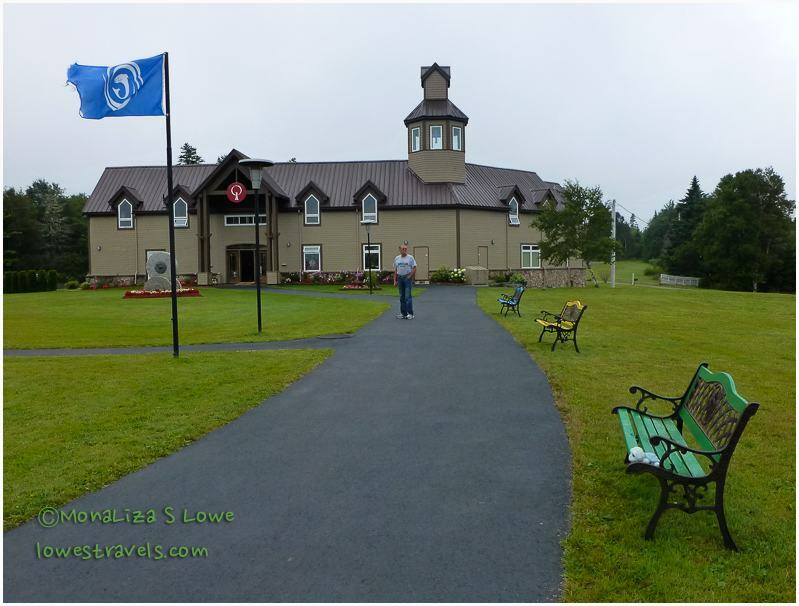 Our blogger friends were like walking visitor centers – many thanks to Pam of Oh the Places they go, (especially the Scone alert! ), Gay of Good Times Rolling (we stayed at the RV parks they were in) Brenda of Island Girl (the French River was the best!) and Judith of Red Road Diaries – they had been here before and provided us with excellent inside information and tips about the Maritimes. And finally, finally..the morning we left for the USA was no exception, as I captured this very serene and calm morning with brushstroke clouds that made it look like a painting. The beautiful sunrise was a great start for our journey back to the good ‘ol USA. The fabulous Acadia National Park! 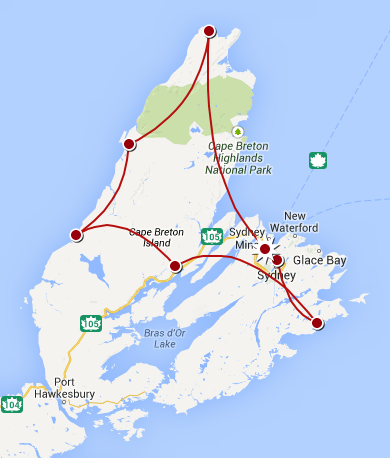 We almost had to nix our planned sightseeing along the Cabot Trail. When we awoke that morning a heavy fog was hiding the Seal Bridge, which we had been enjoying every morning for the past few days. But knowing how fickle fog can be, we hoped the trail would be clear (or clearing) as we proceeded. Hey, this is the whole reason we drove up to the northern part of Nova Scotia! Heavy Fog enveloped the island! Cape Breton Island has divided its unspoiled land into scenic drives – Fleur-de-Lis Trail, Ceilidh Trail, Bras d’Or Lake and Cabot Trail. 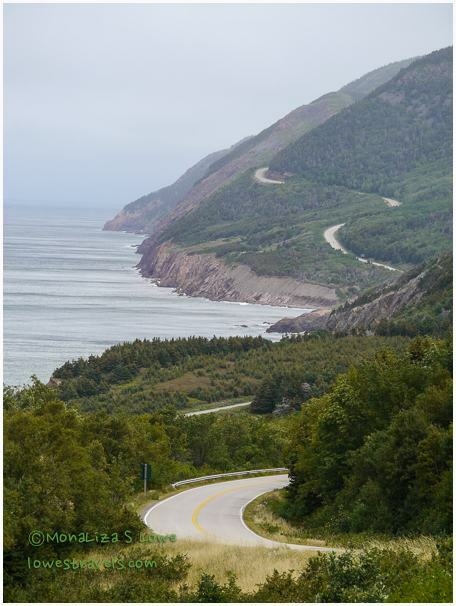 We chose to tackle the longest and most popular Cabot Trail, a 186-mile scenic loop through Cape Breton Highlands National Park. It connects previously isolated communities consisting of Acadian, Irish and Scottish people. 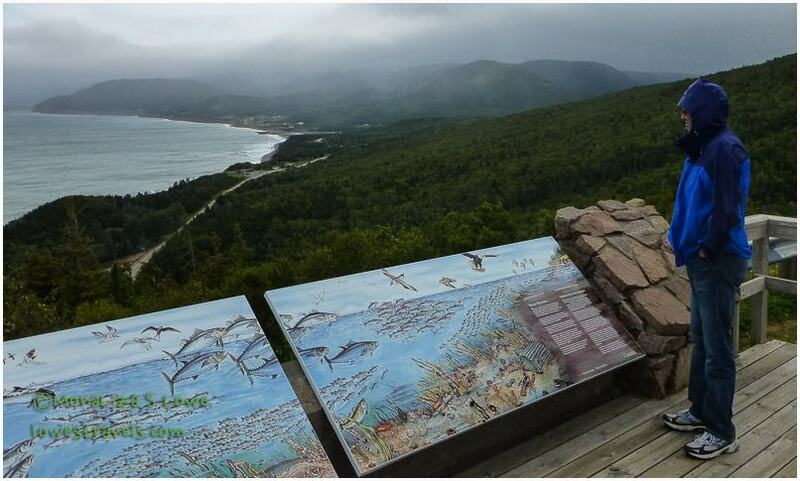 The trail is named in honor of John Cabot, who discovered Cape Breton Island in 1497. As we had hoped, the fog began to clear somewhat as we drove several miles from our “HQ” at the North Sydney KOA toward Baddeck. We entered the trail from the west side – traveling counter-clockwise. There is so much to see and do on this long drive that one could spend several days exploring the area. 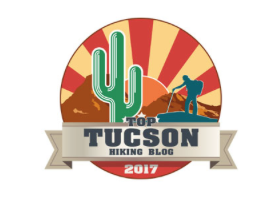 Most folks do it in one very long day, but considering the numerous overlooks with beautiful vistas to take in – and many hiking trails to conquer – we prepared for a slower two-day adventure. We planned for an overnight stop at a B&B near the mid-way point at the top of the island. I’ll share with you just the highlights of the natural beauty that comprises this gorgeous landscape. Upon entering the trail, we briefly stopped at St. Ann’s Gaelic College, a school devoted to the study and preservation of the Gaelic language and Celtic arts and culture. This was the first time we had heard the terms “Gaelic” and ‘Celtic”, and it turns out that Cape Breton is known for its history of living gaelic communities. The school continues to contribute to its preservation. After the quick stop we could not utter a single word in Gaelic, even though the woman in the office tried to teach us a few words. But Steve enjoyed the Celtic music playing in the background! The beautiful grounds at St. Ann’s Gaelic College. 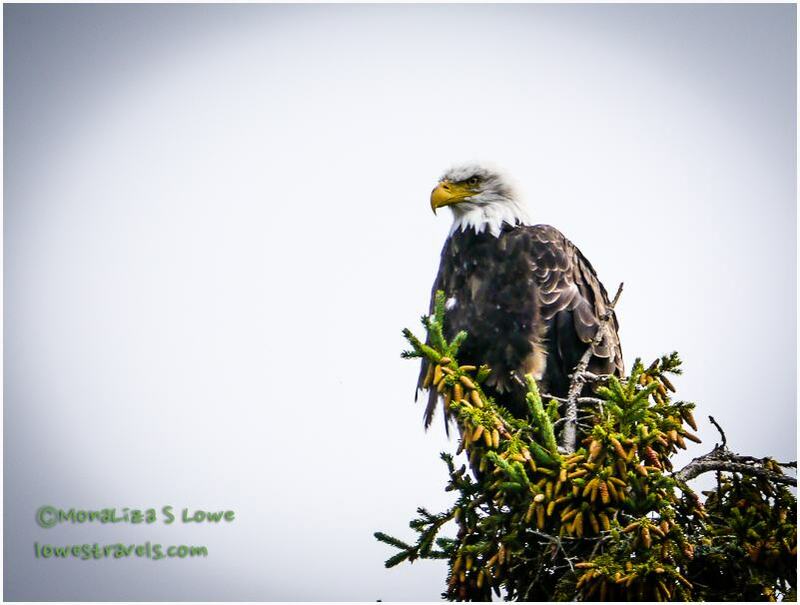 After several miles we spotted the only wildlife we would see on this journey, a majestic bald eagle! I say “the only wildlife”, since despite several signs warning of Moose in the area, we never saw one crossing the highway or while we were hiking. Darn! Ocean scenery, steep cliffs and beautiful beaches dominate the eastern side of the trail facing the Atlantic ocean. We took our first hike on the Middlehead trail in the Ingonish area, which follows a peninsula that juts out into the Atlantic Ocean. At the end of the trail we were rewarded with great views of the Atlantic waters crashing onto the rocks at the bottom of the cliff. Hey, this is a public rock – do your kissing elsewhere! Rocky bluffs and shallow coves characterized the eastern side as we trudged along. 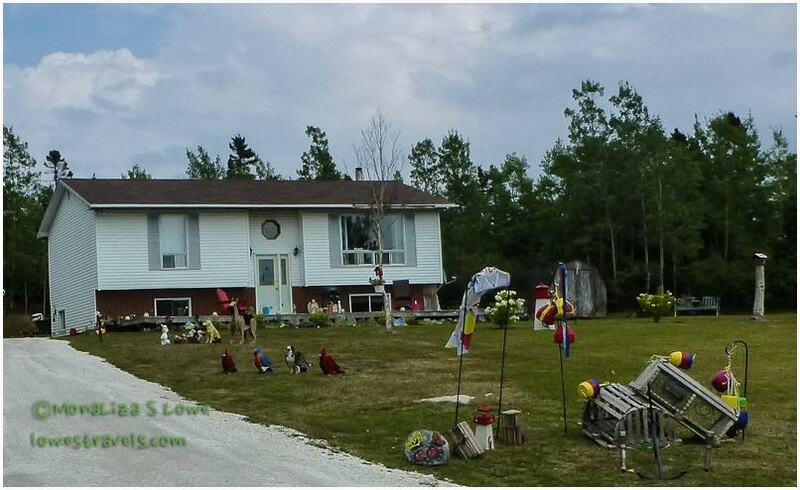 We passed homes with whimsical and colorful yard decor in the Neil’s Harbor area. 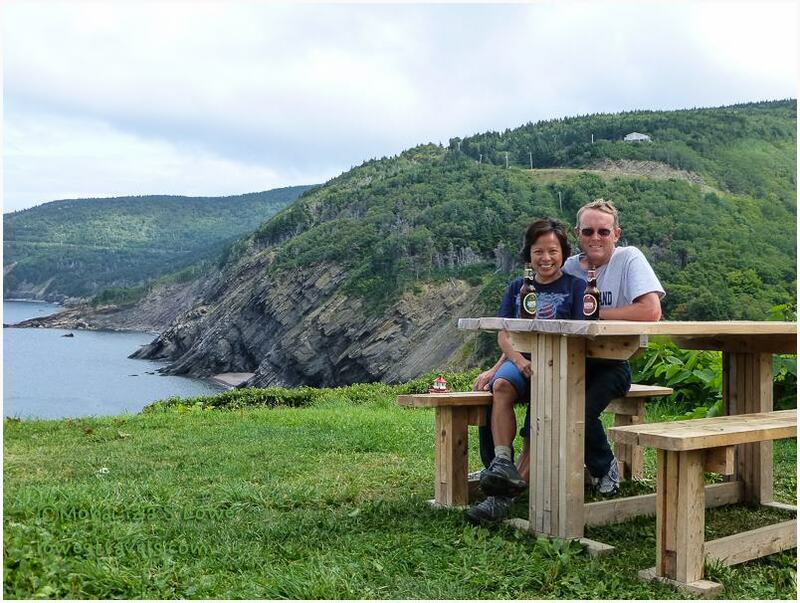 We ended our first day with mussels and cold beers at Meat Cove, which is at the end of a dirt road and as far as you can go on land to the north in Nova Scotia. It is highland vista, serene and very remote, but a spectacular place. The road ends at a small campground that would be a great place to stay in a tent or small trailer, but we wouldn’t bring Betsy out here! Now this is what you call camping! The following day we continued on with our sightseeing, leaving the northern end of the Cape Breton Highlands National Park. 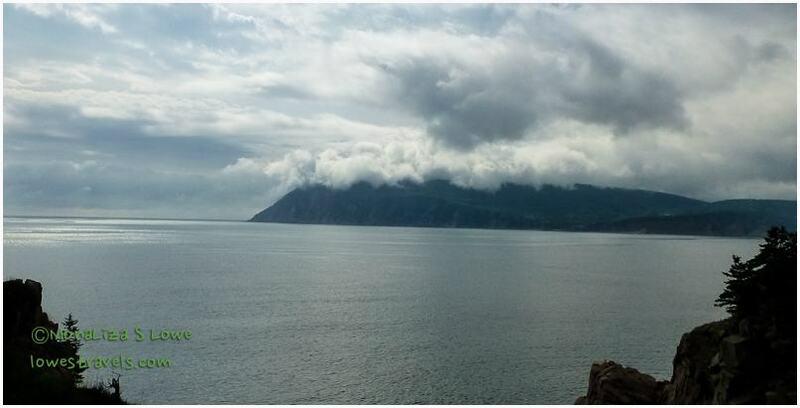 A third of the Cabot Trail runs through the national park along the coast and over the highlands. We climbed the fog-covered mountain and stopped at some viewpoints to see canyons and plateaus where possible. High winds were our companion as we drove around the higher elevations of the trail. Despite the winds, I took a hike and followed the Skyline Trail, described as a dramatic headland overlooking the rugged Gulf Coast. But not today – I could barely stand on the boardwalk as the wind was really trying to blow me over! Steve was smart enough to stay nice and warm in the car, so I asked another friendly tourist to take a picture of me with my hair up in the air. Looking down the northwestern coast of the trail. As the road twisted along the coast we were brought to Cheticamp, home of the Acadians. They are direct descendants of the original Acadians expelled by the British from Nova Scotia in the 17 century. Their preservation of their history and culture gave this area a personality of its own. The Acadian Flag is proudly displayed at just about every home. Margaree Harbour and the yummy seafood we bought to take back home offered a fitting end to our Cabot Trail adventure. Two days was barely enough to really experience the unique culture and diverse heritage around the trail, but we think we covered it fairly well. Although it is easy to compare the Cabot Trail with the California and Oregon coastlines, we think the Cabot Trail just has a character, history, and beauty all its own. As we reached home, the rain began to approach. It proceeded to pour almost non-stop for the next three days, a bummer end to our time in Nova Scotia. The good news is we accomplished everything we had planned before it hit! Vegging in front of the “big screen”. Next up: Back to New Brunswick and then goodbye for now, Canada! On this leg of our Maritimes adventure we headed up north to Cape Breton Island, the northernmost island of Nova Scotia. Cape Breton Island accounts for 18.7% of the province’s total land area. 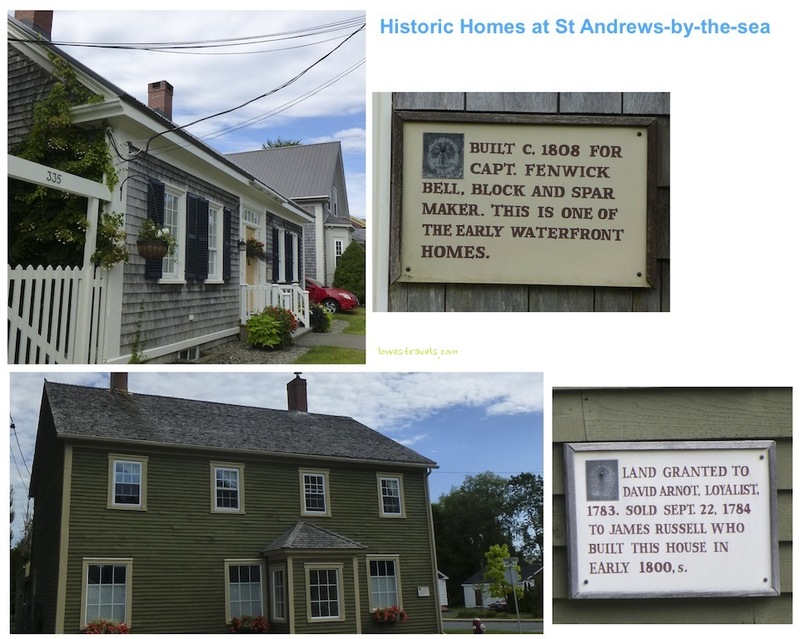 As we drove along, we noticed that this part of Nova Scotia is pretty much uninhabited, unspoiled and teeming with history and diverse cultural heritage. And as is common in this part of the Maritimes, the colorful signage grabbed our attention along the way. The island is connected to mainland Nova Scotia by the long rock-fill Canso Causeway, which on the day of our drive had some traffic due to ongoing road construction. The traffic backup turned out to be a blessing, however, because Betsy was mysteriously running a bit warm and we just happened to be sitting in front of a nice big fuel station. We filled Betsy with diesel while waiting for the next batch of motorists to be flagged through, and wondered why she was running warm just a few days after we’d had the compressor hose repaired. Steve has an idea what’s going on and will keep an eye on it. There are no repair shops nearby, and we don’t intend to go back to Halifax unless we have to (as of this writing we made it back to the USA with no more overheating issues, which frustrates Steve as the problem is intermittent with no apparent pattern). Oops, I got sidetracked with Betsy’s woes. Back to Cape Breton Island. As we settled into our campsite with a fantastic view, we calmed down and began planning our activities. 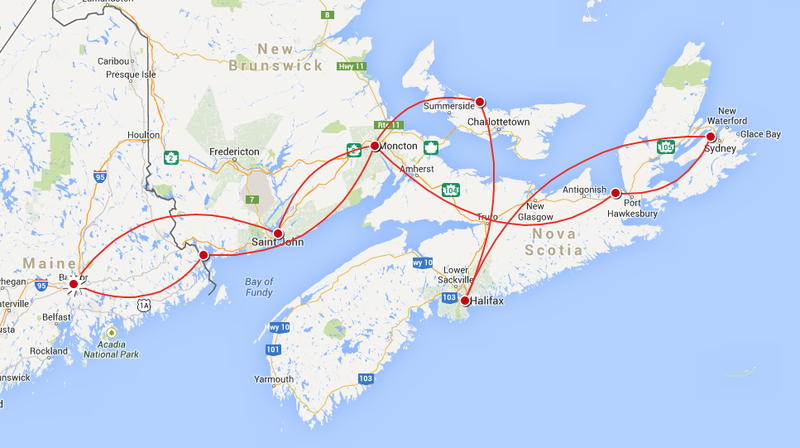 We decided to visit the five cities in Cape Breton: Sydney, Baddeck, Chéticamp, Louisbourg and North Sydney. 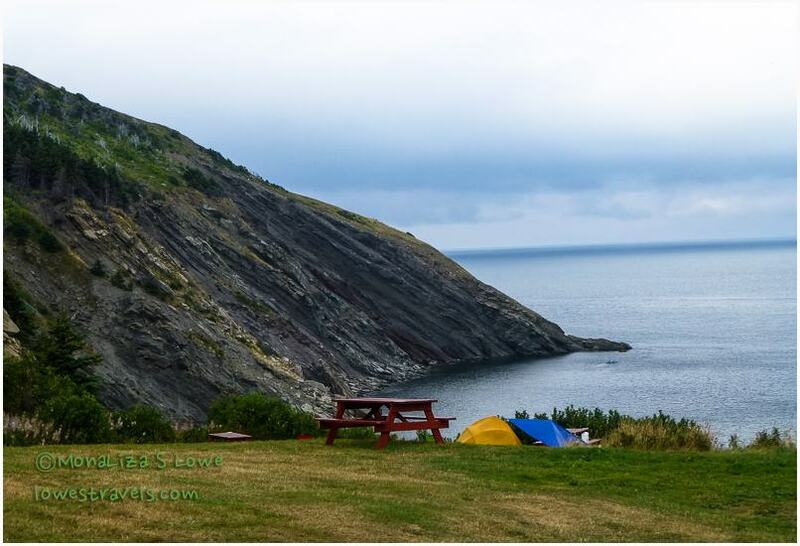 The base camp for our week stay was at the North Sydney/Cabot Trail KOA. 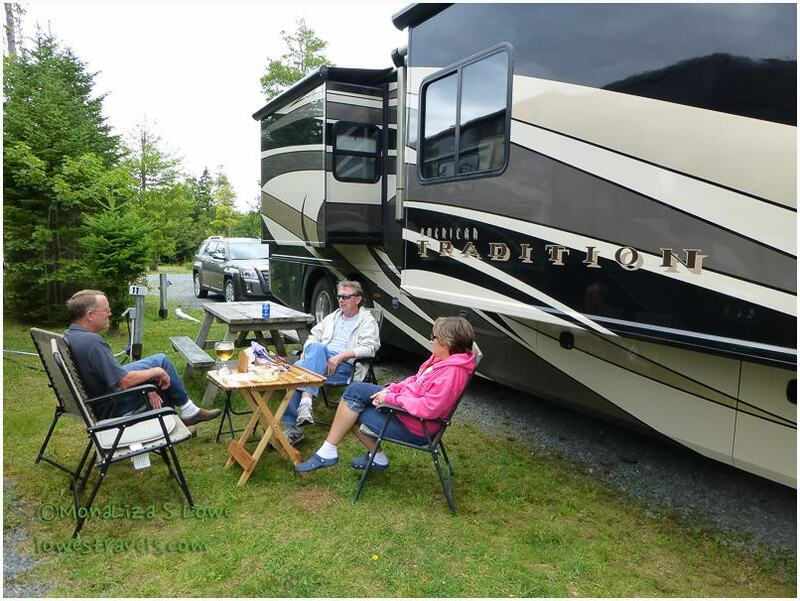 Click here if interested in Steve’s review of this nice campground. 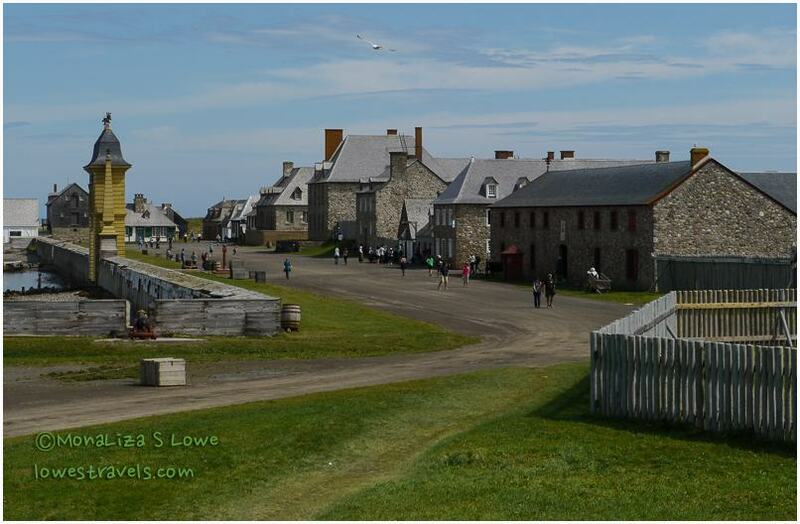 Our first excursion was to Louisbourg, where this largest historical reconstruction in North America took us back in time. 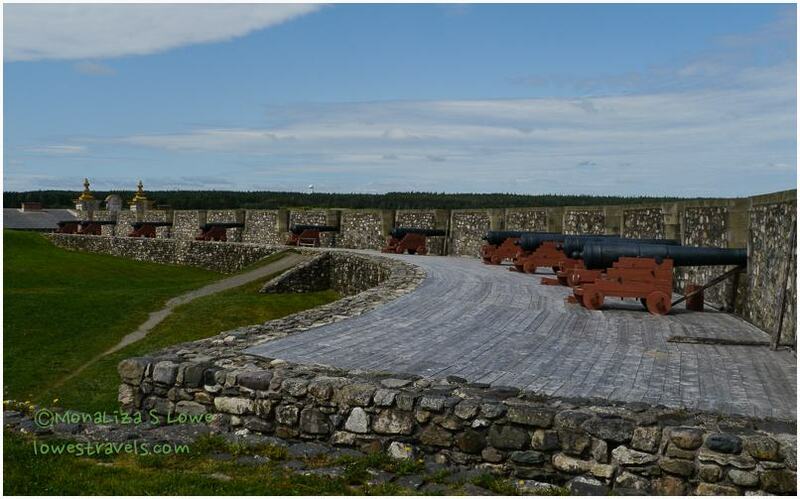 The Fortress of Louisbourg is a Parks Canada Historic Site, and this year Louisbourg is celebrating the 300th anniversary of its founding in 1713. We joined a guided tour and learned that the fortress was built to protect France’s interest in the new world and its massive fishing industry against Great Britain in the 18th century. While walking around the streets and going inside period homes, we were treated with the sights and sounds of the 18th century as costumed interpreters, re-enactors demonstrated to us what it was like way back then. The “maid servant” showed us the layers of her outfit and advised that they usually only bathed annually during those times. Ewe, can’t imagine that! Hey, this grass isn’t baaaaad! We also smelled gunpowder as we watched musket and cannon firing during a military demonstration. We enjoyed our tour of the fortress and thought the reconstruction that took decades to complete was very well done. We learned a lot of Canadian history on this day. 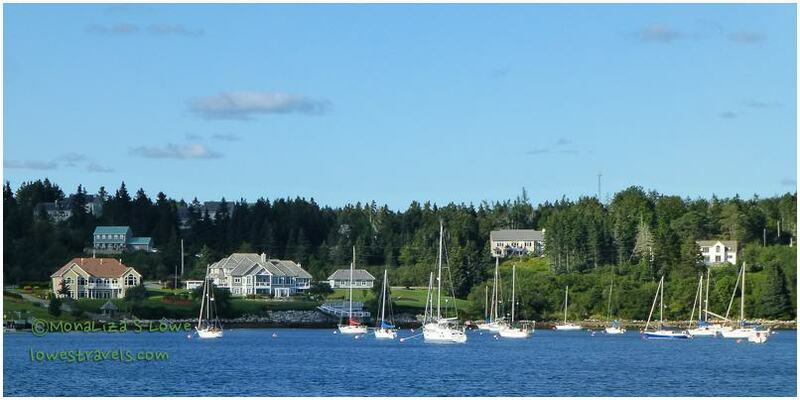 In Baddeck, the most famous resident was Alexander Graham Bell, who built two homes on his estate called “Beinn Bhreagh”, Scottish Gaelic for “Beautiful Mountain.” We were familiar with him as the inventor of the telephone, of course, but he was much more. Going through the exhibits at the museum, we learned that he completed many other major achievements while in Baddeck. 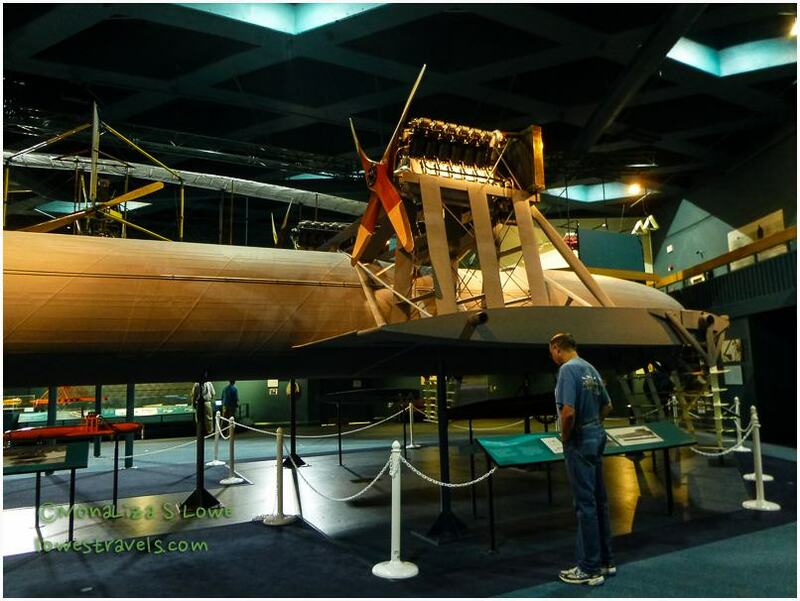 They included a hydrofoil which set a long-lasting speed record for watercraft, and assisting with the first manned flight of an aircraft in the British Commonwealth. He conducted many kite-flying experiments, and invented several devices used in the medical, aeronautical and marine industries. A very interesting man! Full-scale mockup of hydrofoil co-designed by Graham-Bell. 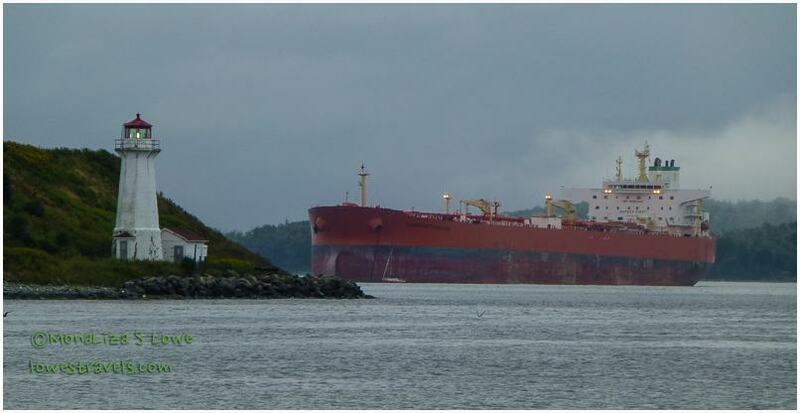 In Sydney, the port city of Cape Breton, the world’s largest fiddle was on display at the port. It stands 55 ft. tall and is made from painted steel which brings it weight up to a hefty eight tons. The Big Ceilidh Fiddle was created to recognize the pre-eminence of fiddle musicians, who have contributed so much to the musical heritage here. Fiddle music was first brought over by Scottish immigrants over 200 years ago. The view from our campsite just kept getting better as the sun began to set. Next up: Exploring the Cabot Trail! This and a few more posts are catch-up stories of our adventure in the Maritimes – we’re typing as fast as we can! 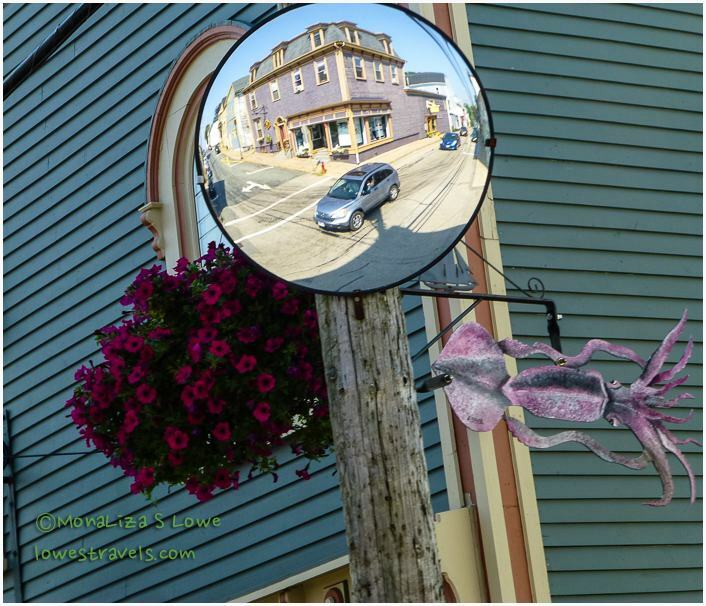 The day after we got an overload of colors at Lunenburg, we continued our sightseeing along the shores of Nova Scotia. Our plan was to visit Peggy’s Cove, which is famous for its picturesque lighthouse. Fortunately, we were tipped off to go there after 5:00pm, as busloads of tourists teem over the cove and lighthouse during the day. 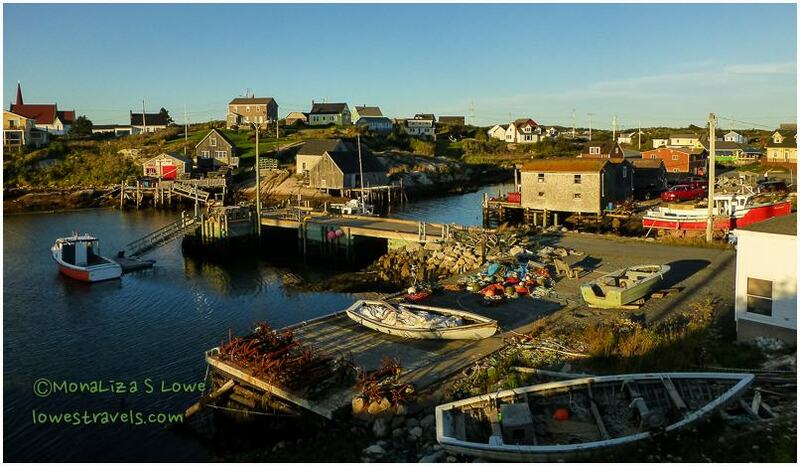 So, instead we explored several towns and harbors along the southern and eastern shores of Nova Scotia. 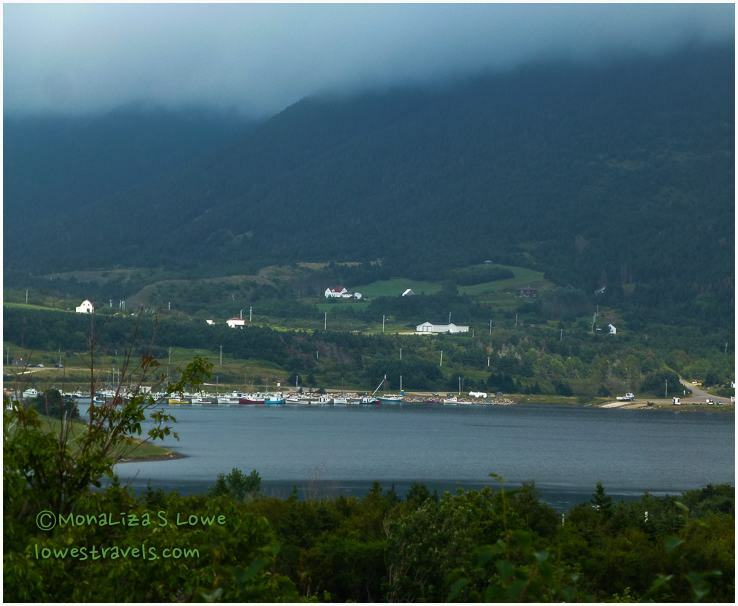 Our drive to the southern shore took us through Mahoney Bay, where three beautiful churches – Anglican, Lutheran and United – caught our attention. 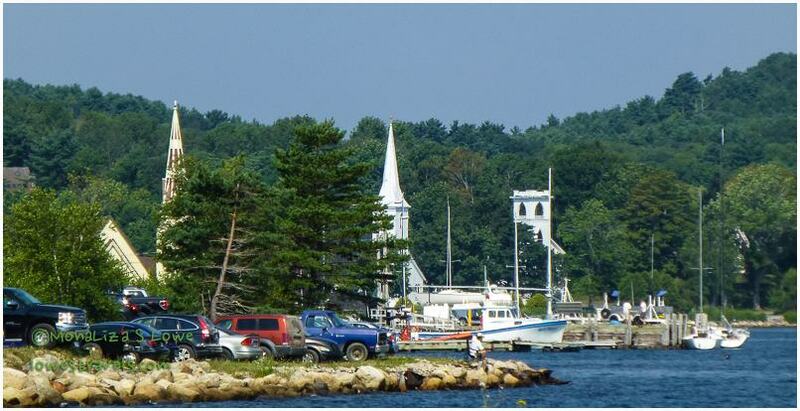 These three elegant churches can all be seen together along Mahoney Bay harbor. Three churches on Mahoney Bay. While driving along we stumbled upon the two Swissair Flight 111 memorials. Fifteen years ago, on Sept. 2, 1998, Swissair Flight 111 crashed into the Atlantic, killing all 229 on board. Two memorials were established – one to the west of the crash site at Bayswater, where the remains of the crew and passengers are buried, and the other to the east at Whalesback, near Peggy’s Cove. 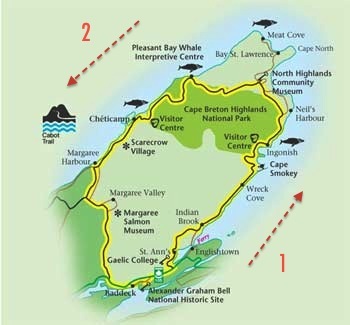 These locations were chosen for their proximity to the crash site, which is roughly equidistant off the shores of Whalesback and Bayswater, Nova Scotia. Nova Scotia’s best beaches are located on the eastern shore. We spent some time at one, Lawrencetown Beach. We noted it was quite a hub of activity with surfers, swimmers and just gawkers like us. Just one of many beautiful harbors along the eastern shore. 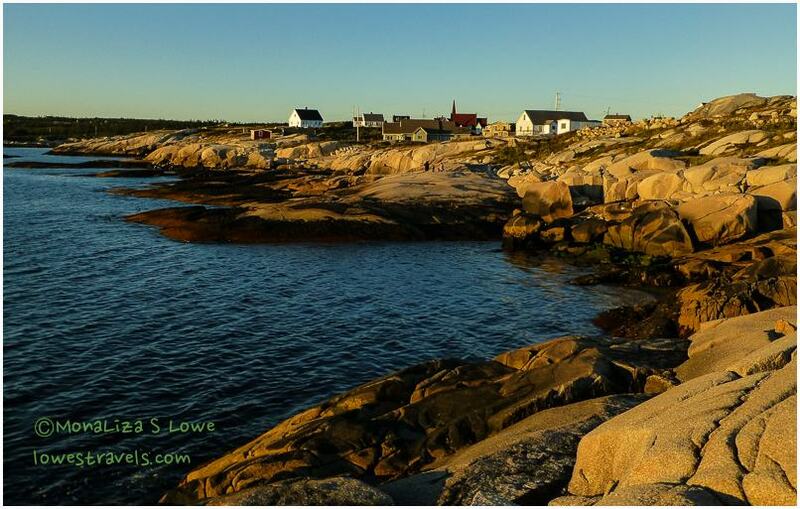 As the sun began to dip, we headed out to Peggy’s Cove. When we heard the name of this place we imagined a large cove, but when we arrived we discovered that it’s a tiny (I mean really tiny) seaside town with a population of about fifty. But because of its celebrated lighthouse and the quaint fishing village, it has become a popular tourist attraction. 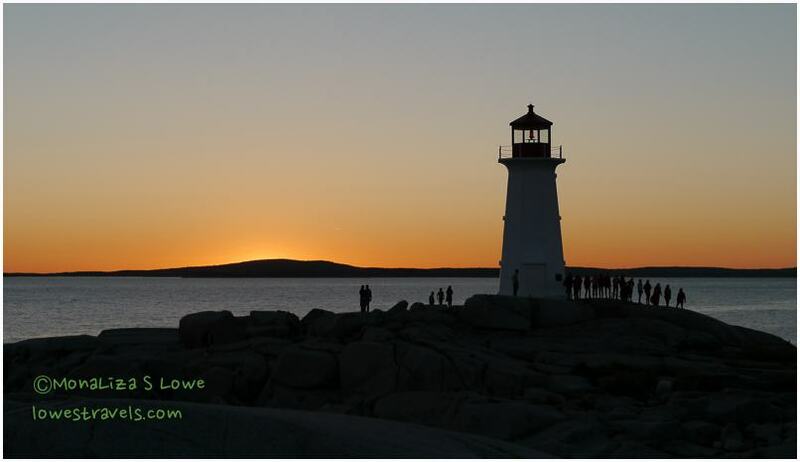 The town and lighthouse at Peggy’s Cove are one of the most photographed locations in Canada. As we walked around the village we saw hundreds of lobster traps, and boats with their fishing gear littering the docks. The rugged beauty of Peggy’s Cove is peppered with huge boulders called “erratics”, remnants left 10,000 years ago by receding glaciers. Although this unique environment has been designated a preservation area, it is still an active fishing community. It’s located about 30 minutes south of Halifax. 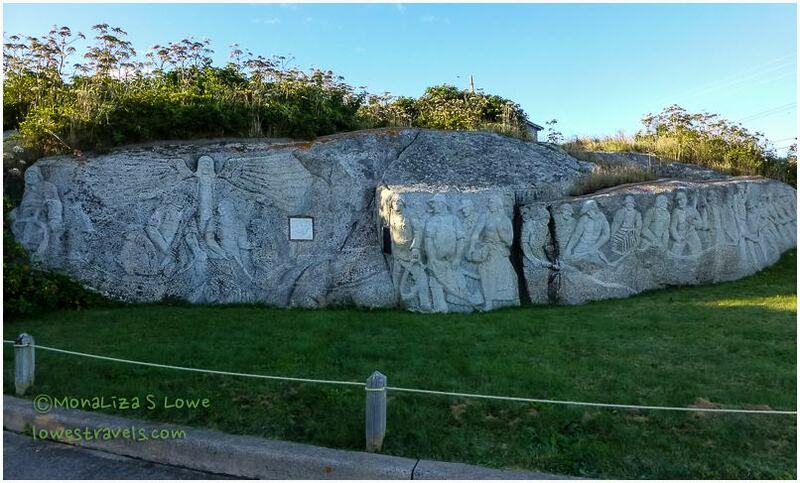 The most famous resident in town was William deGarthe, a Finnish artist who carved a memorial, “A lasting monument to Nova Scotian fishermen.” The 100 ft. granite outcrop depicts St. Michael and 32 fishermen with their wives and children, enveloped by the wings of St. Elmo, the patron saint of sailors – as well as the legendary Peggy. deGarthe began the sculpture at age 70 and took 6 years to complete it. Granite outcrop chiseled as a memorial. 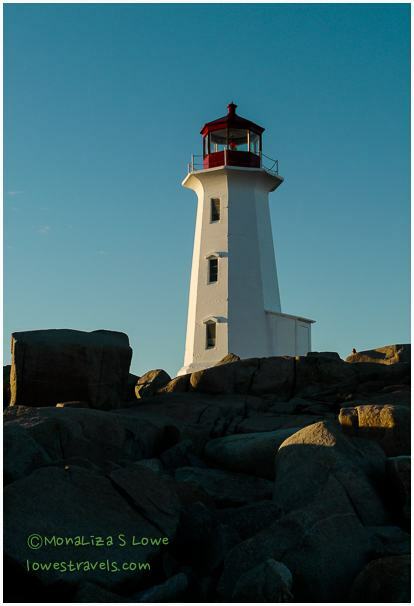 But the centerpiece of Peggy’s Cove is the iconic white and red beacon lighthouse perched atop the rugged granite rocks. 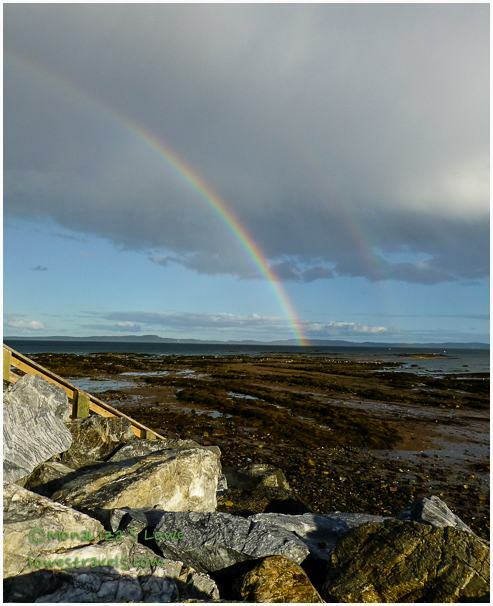 It is located on a rocky headland at the end of Peggy’s Point Road. This well-known lighthouse, officially known as Peggy’s Point Light, was built in 1914 and is 44 ft. tall. The octagonal concrete structure overlooks the mouth of St. Margaret’s Bay. Between 1975 and 2009, the ground floor of this lighthouse operated as a post office where visitors could mail their postcards in the summer months – the only lighthouse post office in North America at the time. While the post office is no longer there, the image of this famous lighthouse on top of the giant rocks with the crashing sea waves is considered just as beautiful as it has been for almost a century. Iconic red and white Peggy’s Point Light. The lighthouse sits on these granite rocks. Since many visitors aren’t sensible enough to move away from the lighthouse at sunset so the dozens of photographers can get a good shot, I tried to work around them to get a decent shot as the sun hid behind the horizon. Visitor’s group picture at the lighthouse. 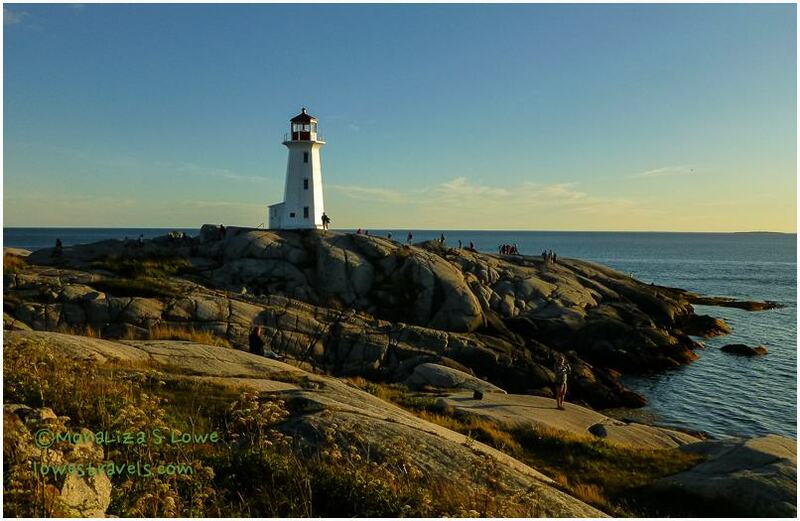 Although there are many similar lighthouses in eastern Canada, this is a genuine star, picturesque and simply beautiful! 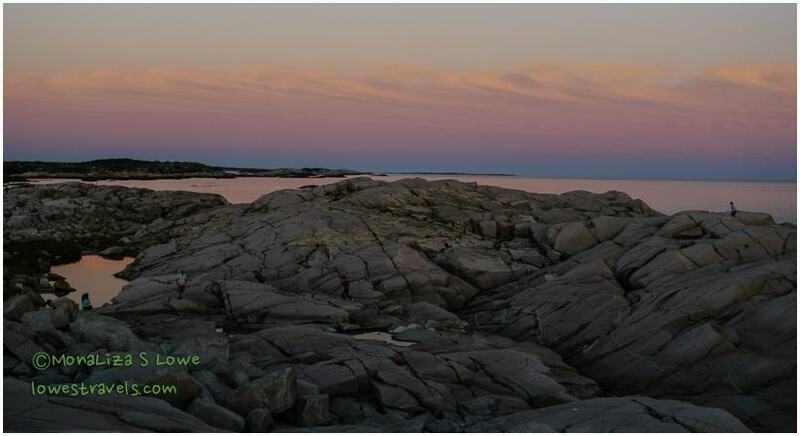 Peggy’s Cove at dusk, with St. Margaret Bay in the foreground and the Atlantic Ocean in the distance. By the time you read this we are just arriving back in the U.S. to play catch-up with our posts, now that we have good internet connectivity again. Steve almost drove off the road when he saw all these bras! 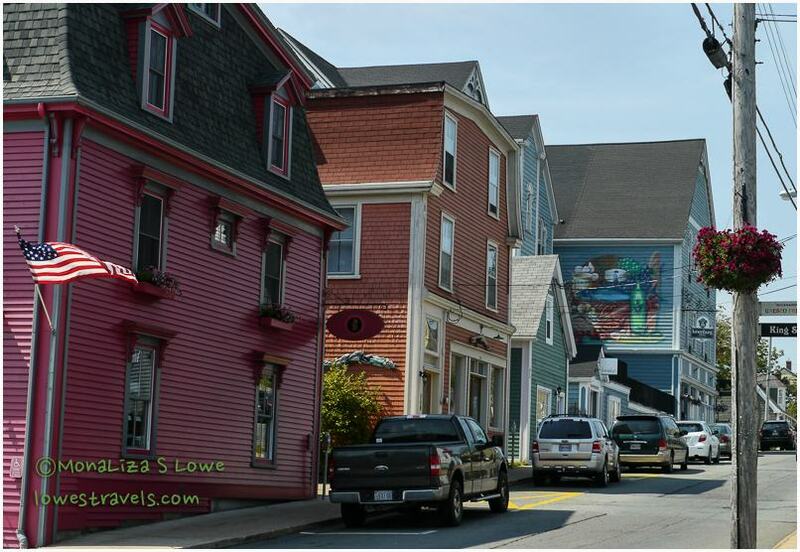 The old town of Lunenburg is one of three Unesco World Heritage sites in Nova Scotia. It received this honor because it is one of the best examples of a classic British colonial settlement and for its remarkable level of conservation. 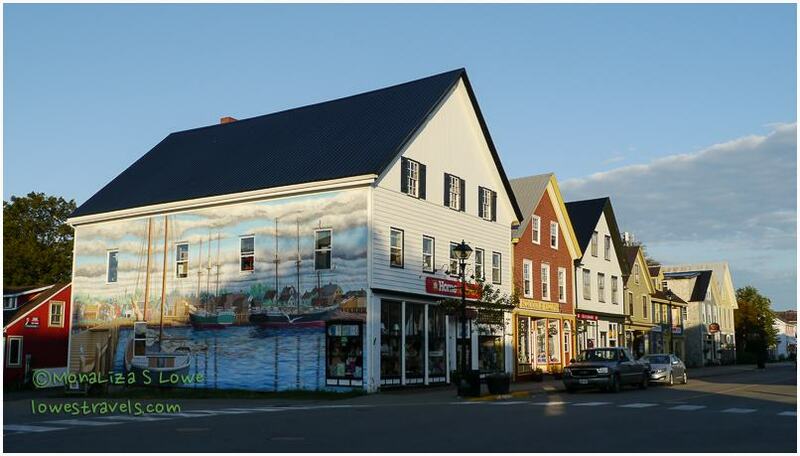 First, below is a mural of the old Lunenburg, then check out my current images and you’ll notice the town is pretty much unchanged. 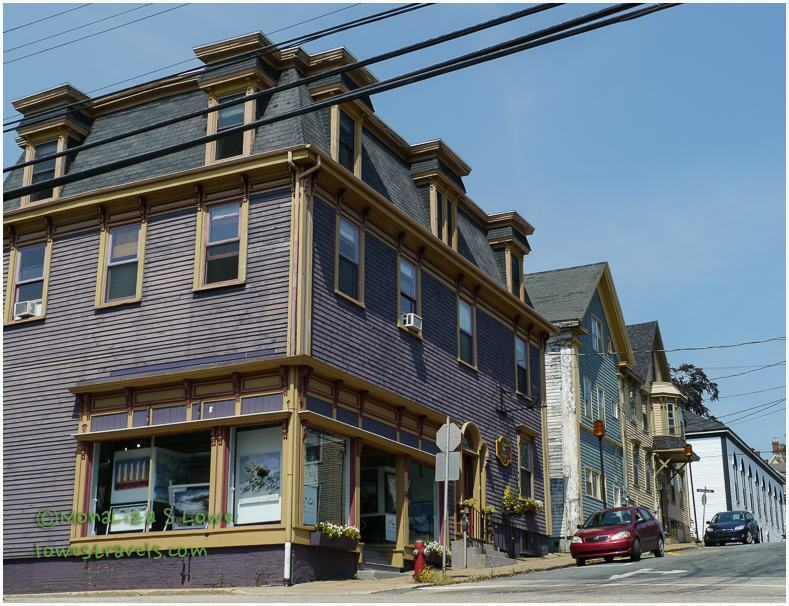 Seventy percent of the original buildings from the 18th and 19th centuries greeted us with their colorful facades. The locals have safeguarded the town’s identity throughout the centuries by preserving the wooden architecture of the houses and public buildings, some of which date back to the 18th century. We took a walk around the narrow streets and enjoyed the charming architecture and brightly painted wooden buildings of today. Every block featured a collection of colors from the rainbow for their paint jobs, which made the street views a real treat to look at. Around town were 44 fish sculptures honoring the top 20 fish and shellfish species landed by the area’s commercial fisheries. As we strolled along it became clear that the town’s vibrancy is what draws so many people here for a visit. This little town is teeming with craft shops, art studios, inns and dozens of excellent restaurants. We highly recommend a relaxing half-day visit here! Back to to the waterfront, even ships/boats were in an array of bold colors. 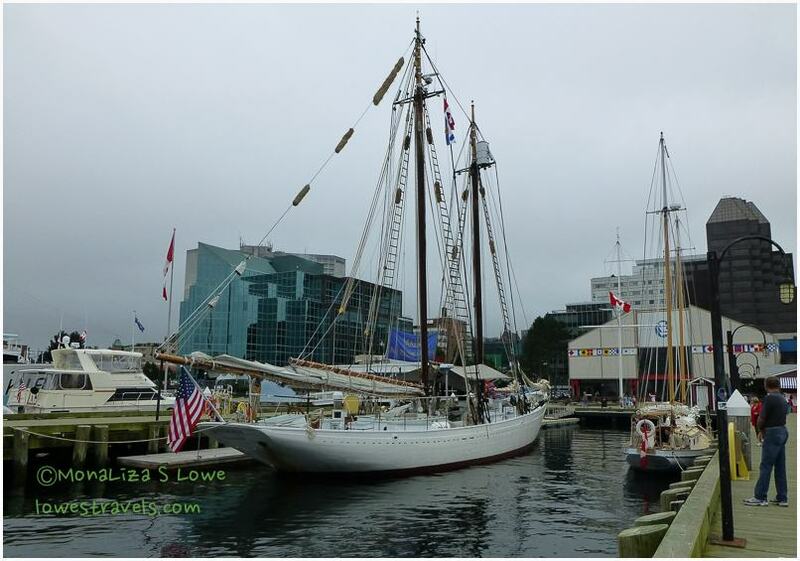 While strolling on the wharf a tourist asked us where the Bluenose II was docked. We couldn’t answer him, since we didn’t even know what it was. Later on we learned it is Nova Scotia’s world-famous (maybe I’m the only one who hadn’t heard about it) sailing ambassador. Bluenose II is a schooner designed in the spirit of the original Bluenose. 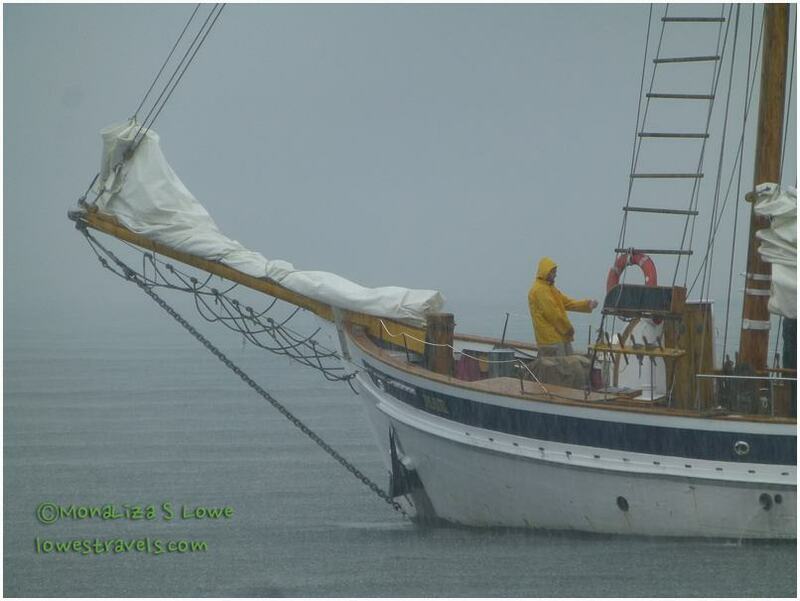 The original vessel, which has appeared on the Canadian dime since 1937, was launched from Lunenburg as a fishing and racing schooner in 1921. After 17 years of racing victories she sank on a coral reef in 1946. The Bluenose II is currently undergoing a major restoration in one of the dry-docks at Lunenburg. 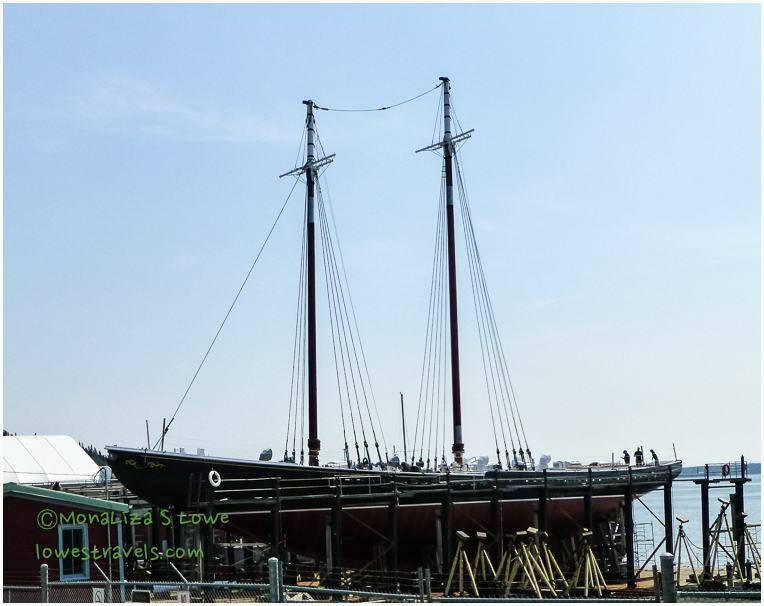 It returned to dock for repairs after re-launch Sept. 29, and there is no clear date for it to sail again. We continued driving further to a tiny fishing village called Blue Rocks to check out cool bluish sedimentary rocks at their shore. Even the rocks are colorful! I managed to blend in as well! Can you see me snapping away? Next up: Peggy’s Cove and more! 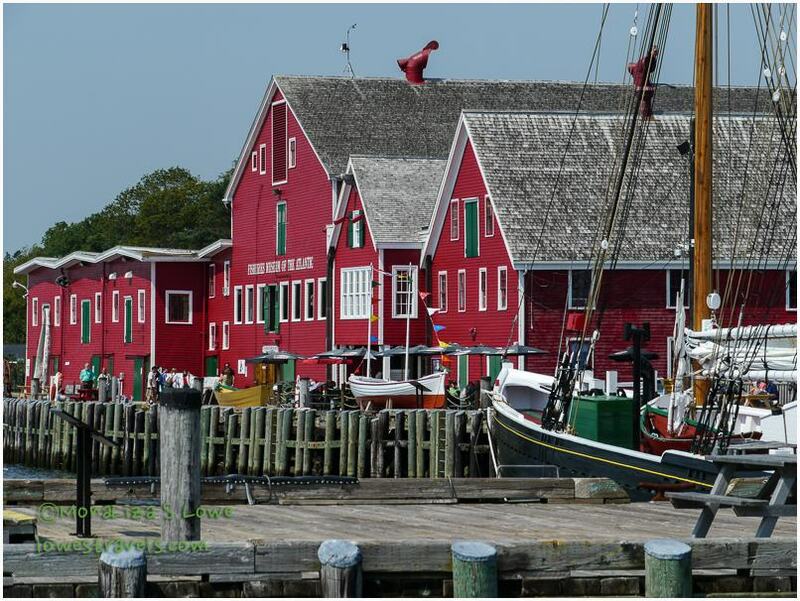 After many enjoyable experiences it was time to leave picturesque Prince Edward Island – for a price! The outrageous bridge toll is paid when leaving the island, and after paying this one we’ll never again complain about how high the tolls were on California bridges! $59 – this is not a dinner receipt, folks! This was one of our longer drives, from PEI to Halifax, Nova Scotia. Once again, colorful and vibrant signs welcomed us to the Nova Scotia province. But as we were approaching our campground along a narrow road, we heard a loud hissing noise. Steve checked all the monitors and nothing was warning us of a problem. The noise was very loud when we were accelerating, on a road with hills on each side and it was easy to hear because of the echo. Since we were only a couple of miles from the campground and there was really nowhere to pull over anyway, we proceeded. At the campground, Steve checked out the engine as best he could with me revving it but could not locate the source. While checking into our site, the park manager advised us there was a Cummins engine shop only 11 miles away. Wow, were we happy to hear that! We made an appointment and showed up bright and early in the morning, limping along the side streets to stay off the throttle as much as possible. While Betsy was being diagnosed and hopefully repaired, we went to the vibrant capital city of Nova Scotia by the sea, Halifax. Not knowing how long we had to hang out there, we concentrated our activities to the harbor area. 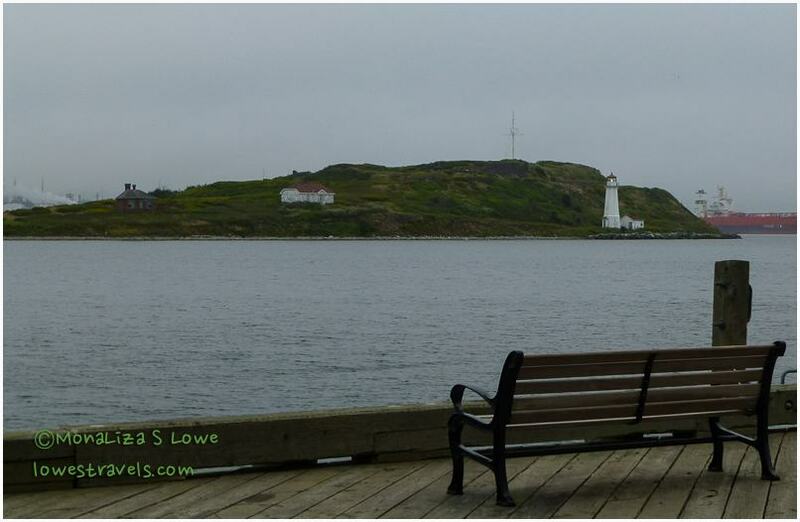 To me, Halifax seemed to be only in the movies or a setting of a good mystery book. Yet here we were about to experience it! We thought the city seemed like a mini San Francisco, but with far fewer people and much cleaner. 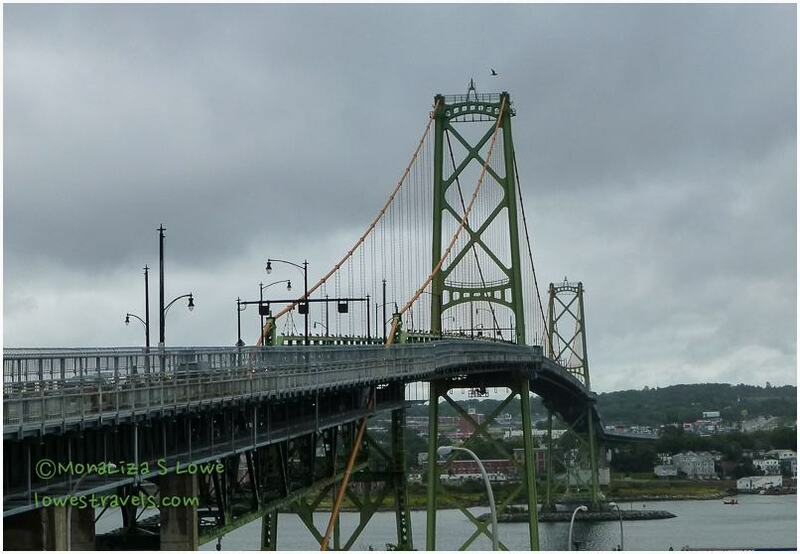 Besides, they painted their bridge with my favorite colors – green and yellow! The Macdonald bridge leads us over a busy shipping channel and into Halifax. 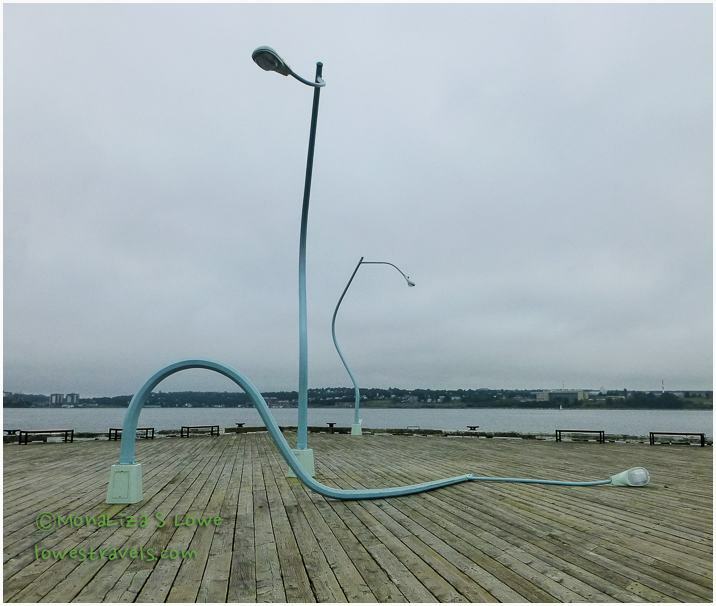 The 3 unique sculptures below are called “The Way Things Are”, and are on public display until Sept 21. In the foreground is “Got Drunk, Fell Down” (the lamp that has fallen down and its friend is looking down on it with some concern), and in the background is “Fountain” (the lamp post that looks like it is relieving itself into the harbor). The display was created by Chris Hanson and Hendrika Sonnenberg. We learned a bit of history as we read the inscriptions on the monument about how the Acadians were removed from Nova Scotia and imprisoned on Georges Island just across the harbor. This period in 1755 of systematic deportaton of Acadians was called the Grand Derangement or Great Upheaval. 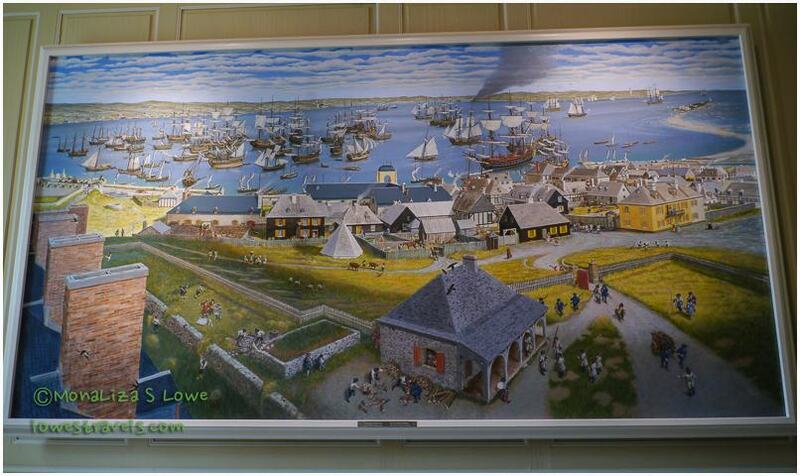 Click each image for a brief history about Georges Island. Across the harbor is Georges Island, where the Acadians were imprisoned. Imagine thousands of people imprisoned on this tiny island! And we certainly don’t get to see this everyday, a cargo ship carrying gigantic cranes into the harbor! Other sights on the waterfront. I managed to take a panoramic shot of the waterfront just before a tremendous downpour came through the area. Since it is a big city harbor, all kinds of ships/boats/schooners/yachts were docked, and even the Maine Maritime Academy was in town. Then the rain came, and it poured for half an hour. Steve thinks this looks like a commercial for Gorton’s fish sticks! After four hours we got the call – Betsy was fixed and can be taken home! 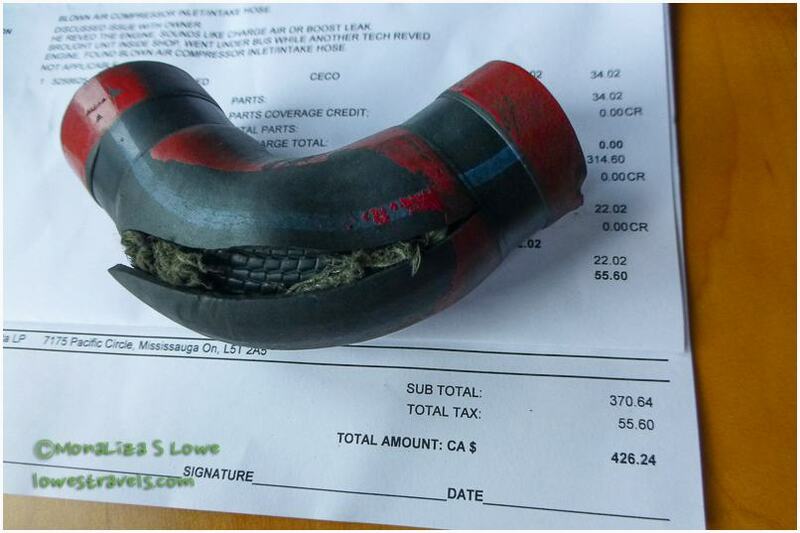 We paid for what seemed to be the world’s most expensive hose – $426! 95% of that was labor, of course, and our extended warranty doesn’t cover hoses, of course. The hose was for the inlet to the air compressor, which compresses air for the brakes and suspension air bags. It had split wide open, and although noisy, no damage was done. We were happy to get Betsy back – being homeless even for a few hours is nerve-wracking especially when you are in a foreign country! We headed back to the campground to get her set up again. We stayed at Woodhaven RV Park, and they offer a most unique and yummy service – fresh cooked lobster prepared for their customers at only $7.00 per pound. You better believe we took advantage of that offer, and it was fantastic! If interested, you can read Steve’s review of the campground here. At the end of the day we shared our repair story and Halifax sightseeing with our next door neighbors, Ron and Louise. They are full timers from Florida, and we hope to see them again this winter when we are there. Our next adventure took us to the coastal wilderness where we experienced yet another Bay of Fundy phenomenon – a coastline sculpted by the worlds highest tides. 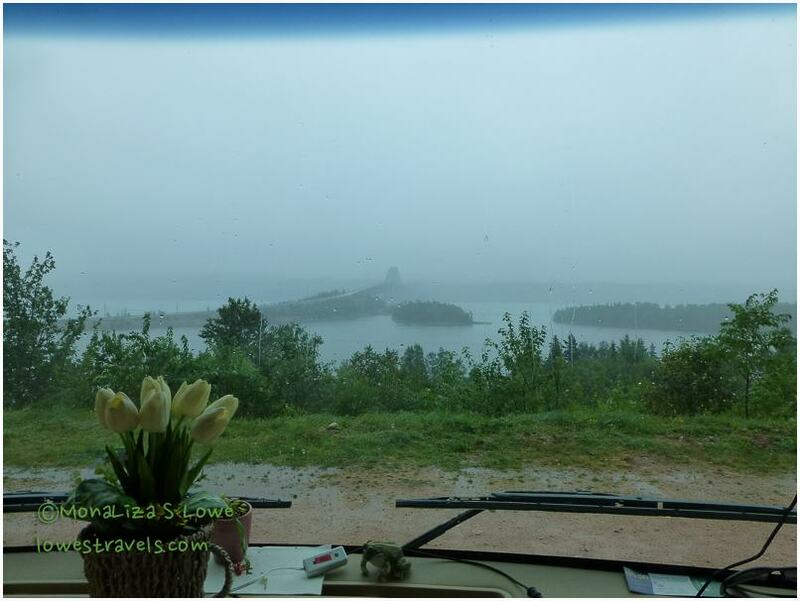 It was a long and scenic drive to the Fundy Trail Parkway, and a bit foggy when we arrived. 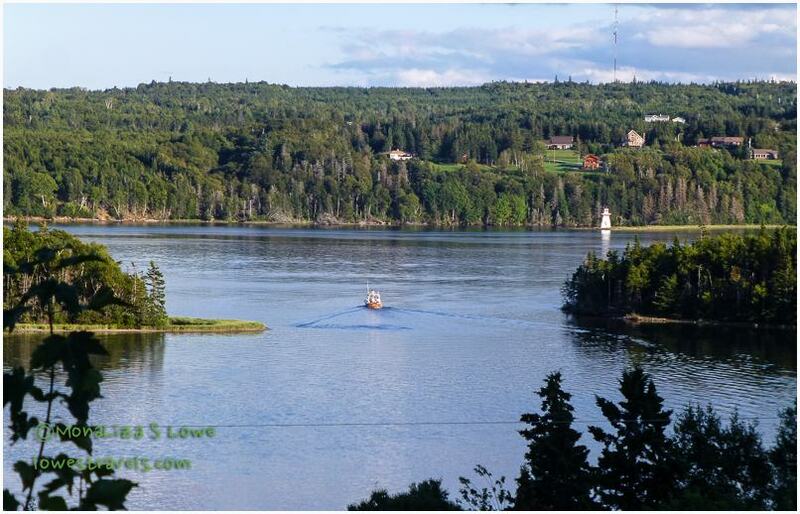 So, you may wonder, what is the Bay of Fundy and what’s the big deal? The Bay of Fundy is a bay between the Canadian provinces of New Brunswick and Nova Scotia. The bay is known for having the highest tidal range in the world because it is funnel-shaped across its width, deep at one end and shallow at the other. This configuration forces tides to be pushed higher as they move up into the Bay. We were fascinated to learn that the highest tides on earth fill the bay with over one hundred billion tons of seawater – as high as a four-story building – and brimming with diverse marine life. 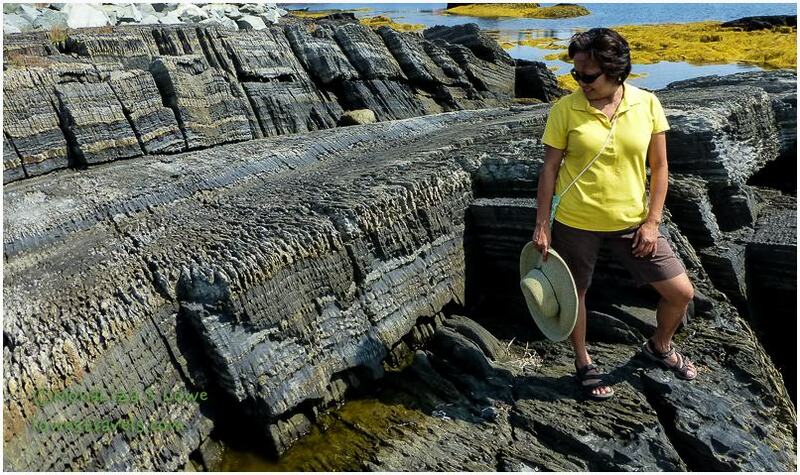 Just hours later at low tide, we were able to stroll among the rock formations on the seabed. A colorful crafts store near the beach. There are three interesting ways to observe the tides: the Vertical Effect, the Horizontal Effect and the Tidal Rapids. In my previous post, the Reversing Rapids were an example of Tidal Rapids. 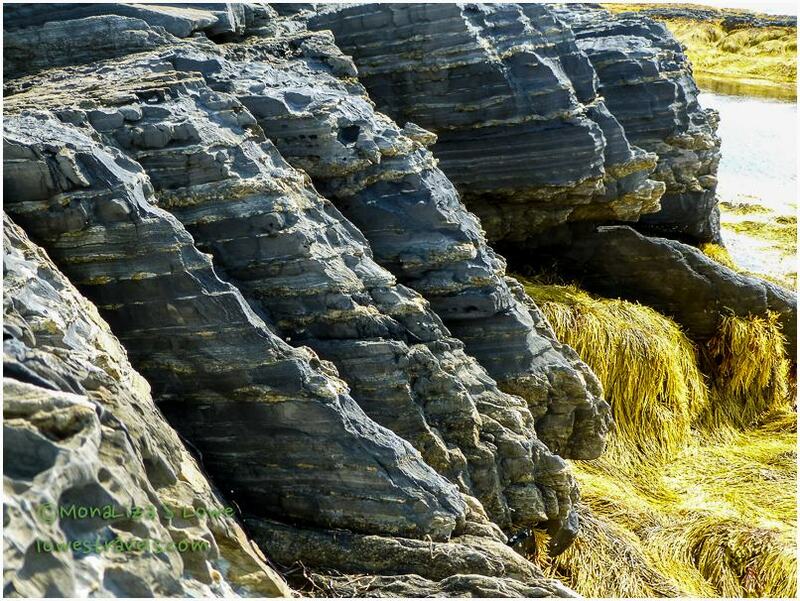 During our exploration at the Fundy Trail Parkway we saw an example of a vertical tide. At St. Martins, gateway to the Fundy Trail Parkway, we spotted a small harbor where fishing boats were sitting on the ground during low tide. On our way back home we saw the boats bobbing in the water alongside the wharf. 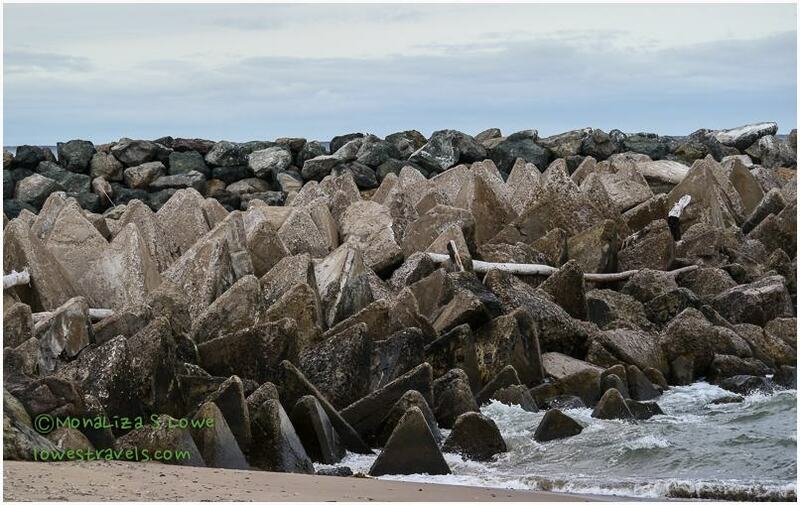 Small harbors are the best place to see vertical tide changes that can be 50 ft or more! Low tide at St. Martins – no fishing for a while, folks! 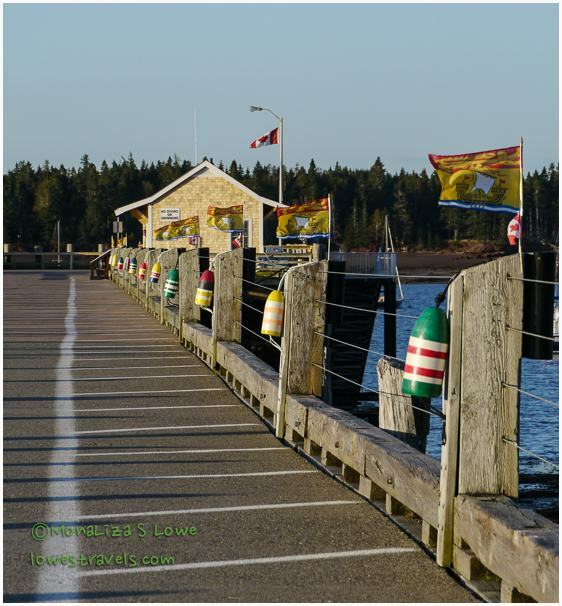 High tide at St. Martins – OK, let’s go catch dinner! We stopped at many lookouts to view towering cliffs, undeveloped coastline and panoramic vistas of beaches. The Fundy Trail winds its way along one of the last remaining coastal wilderness areas between Florida and Labrador. Looking out on Pangburn and Melvin beaches during low tide – they don’t exist at high tide. At one point we hiked down to follow the Fundy Footpath all the way to Fundy Point. We skirted along Big Salmon river and hugged the coastline, where Steve decided to create his own path all the way to where the river flows to the ocean. He thought we would then walk across the shallow beach there and walk back up the path on the other side. Wrong! Steve created his own footpath to the beach, but his mission was doomed. When we arrived on the beach, we witnessed horizontal tide, which happens when the low tide retreats as much as three miles, leaving vast areas of the ocean floor exposed. Let’s see how far we can walk out to the ocean – this would all be deeply covered in a couple of hours. Unfortunately we were just a little late and the tide was coming back in, so we had to double back on the trail we had just taken. Oh well, nice try! Let’s get out of here before the tide catches us! …finally arriving at the suspension foot bridge – the easy and correct way to cross Big Salmon river. Goofing off at the suspension foot bridge – showing Steve this is the right way to cross the river! With the fog lifting by early afternoon, we chose to follow the path to the Fuller Falls lookout, then hiked just over a mile down to Melvin Beach. We noted the clay colored cliffs and colorful sandy stones that we walked on. The tide was starting back in so we chose to stay at Melvin Beach and not cross over to Pangburn Beach. Melvin Beach and its huge piles of colorful smooth stones. Searching for the perfect stone. Note the high tide line on the wall behind me – and it has already been coming in for some time when we took this shot. The entry fee was worth every penny, for we thoroughly enjoyed each view, path and trail we followed. The 10-mile Fundy Trail Parkway is well constructed and maintained within the most picturesque area of the Bay of Fundy, and it provided us with a variety of experiences along its length. On our way home we stopped by St. Martins village and enjoyed some more local fresh and delicious seafood, this time a lobster roll and a cup of delicious chowder. The restaurant had a great view of beautiful sea caves – shallow features carved into sandstone and conglomerate caused by physical erosion of the high and low tides. We had a beer and some yummy seafood here while checking out the nearby sea caves. An overcast sky lends mood to some shots. Folks here tend to use and match colors on their structures very well. And back to the curvy and steep grades along scenic highway 111 . Curvy and steep grades along highway 111. We stopped and bought wild Canadian blueberries, with which I baked a delicious pie that we savored after a long day of exploration. Wild blueberries are best for pies! We never fail to admire the Grand Bay-Westfield visitor center as we passed by it on our way in and out of the campground. 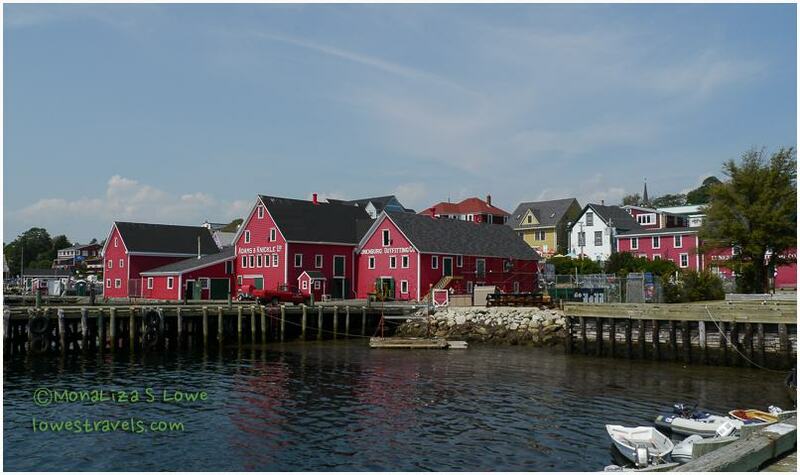 We have more stories and pictures to share – the Canadian Maritimes are so scenic and colorful. The weather has been near perfect, sunny but a bit breezy at times. Stay tuned!